Fred Olsen offer 4* small and intimate ships with a ‘British country house’ feel. 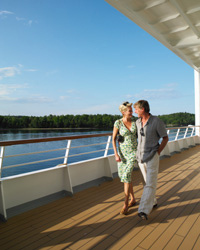 The Fred Olsen ships attract discerning mature guests, although families are still welcome on board. Fred Olsen cruises are also the perfect cruise line for single travellers, with single occupancy cabins, and even dance hosts on board so you will always have a dancing partner. Dining on board is in 2 sittings where tables and times are fixed, however there is a more casual, open sitting in the ships buffet restaurant. There are generally three formal nights on a two week cruise, with the remaining nights split between informal and casual; however there may also be themed nights whilst you are on board. Evening entertainment consists of string trios, pianists, musicians, entertainers and shows; but in the ships lounges as there are no big theatres on board. Fred Olsen offers a selection of Vista themed cruises where you will be joined by experts and the cruises entertainment and activities are themed around this. Categories include Food & Drink, Geography, Natural World, and Hobbies & Interests to name a few. 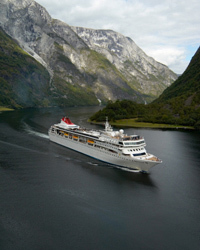 Fred Olsen offer cruises of varying durations, from short break cruises to longer world cruises, sailing from the UK or fly cruises to various destinations. Currency on board is GBP As a general rule, Fred Olsen suggest £2.00 per adult guest per day, for both your cabin stewardess and your restaurant waiter, which is always very much appreciated. For your convenience the tip is automatically added to your cruise account, at the end of your holiday. Guests may adjust gratuities while on board at their discretion.